Timothy J. Clarke is no stranger to the Church of God. 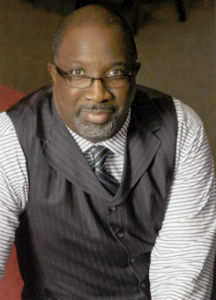 For thirty-three years he has served as senior pastor of First Church of God in Columbus, Ohio. We’ve come to know him as one who consistently preaches the gospel with boldness and a dynamic style all his own. Countless camp meetings, conventions, conferences, and revivals have been blessed tremendously by his warm spirit and candor, mixed with just the right amount of humor. The Church of God Convention in Anderson has provided a platform for his deeply resonant delivery of the gospel, including a memorable message preached at the Global Gathering in 2013. We’re pleased to announce that one of our own—Timothy J. Clarke—will speak at the Monday evening kickoff worship session—also featuring worship led by Christian recording artists Selah. Under Clarke’s leadership, First Church of God in Columbus, Ohio, has grown to be one of the largest and most influential Church of God congregations in the movement. His weekly television broadcast is a viewers’ favorite on The Word Network, a popular religious station carried by DirecTV, Comcast, and several other cable providers. Clarke has communicated the truth of Christ through the written word, too. He’s penned multiple books, such as Reclaiming Your Spiritual Health and Paying the Price to Win: Putting Your Faith into Action. In 2001, he founded the Berean Fellowship of Churches, which unites more than fifty congregations of multiple faith communities. Timothy Clarke and his wife Clytemnestra Lawson are the proud parents of adult children Dionesha (Ocie) Clarke-Logan and Joscelyn Renee Clarke. Clarke and his wife are also the proud grandparents of Ryan Joseph Clarke and London Yvonne Logan. Don’t miss the kickoff session of CHOG Convention 2015: Be Bold. Reclaim. Timothy J. Clarke will be there. Selah will be there. Most importantly, we believe the Holy Spirit’s presence will be powerful and palpable. Will you be there, too? Expect great things at CHOG Convention 2015, June 22–25 at Crossings Community Church in Oklahoma City. For more information, visit www.chogconvention.org. This entry was posted in All Church of God, Church of God Convention and tagged announcement, Be Bold Reclaim, camp meeting, CHOG, Church of God Convention, Crossings Community Church, NAC, Oklahoma City, speaker, Timothy Clarke. Bookmark the permalink.